" Combining a likeable group of core characters with just the right mix of dramatic and comedic elements, this is a film that charms its way past its flaws and gives audiences a happy note to dance home to. " Gus Lobel (Clint Eastwood) has been one of the best scouts in baseball for decades, but, despite his efforts to hide it, age is starting to catch up with him. Nevertheless, Gus - who can tell a pitch just by the crack of the bat - refuses to be benched for what may be the final innings of his career. He may not have a choice. The front office of the Atlanta Braves is starting to question his judgment, especially with the country's hottest batting phenom (Joe Massingill) on deck for the draft. The one person who might be able to help is also the one person Gus would never ask: his daughter, Mickey (Amy Adams), an associate at a high-powered Atlanta law firm whose drive and ambition has put her on the fast track to becoming partner. Against her better judgment, and over Gus's objections, Mickey joins him on his latest scouting trip to North Carolina, jeopardizing her own career to save his. Forced to spend time together for the first time in years, each makes new discoveries - revealing long-held truths about their past and present that could change their future. Clint Eastwood in a baseball film? Put me in coach, I’m ready to play! Keep in mind, as a lifelong fan of both Clint and baseball, there’s a lot that would’ve had to have gone wrong for me to not enjoy this film. And in all honesty, there’s not a lot for me to say so I’m going to keep this short and sweet. 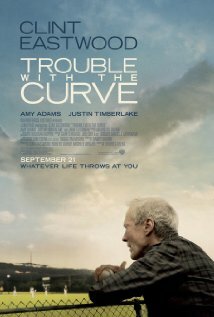 Is Trouble with the Curve formulaic? Why yes, yes it is. Is it predictable? Pretty much. And the element of the film that is probably most deserving of whatever criticism it receives is how blatantly contrived the ending is. But I couldn’t care less about any of that because the film hits a homerun (my apologies) with its casting. Combining a likeable group of core characters with just the right mix of dramatic and comedic elements, this is a film that charms its way past its flaws and gives audiences a happy note to dance home to. It’s really not complicated. Clint transitions his crotchety character in Gran Torino into a more light-hearted role. However, he’s still as cranky as ever. When it comes to his job as one of the greatest baseball scouts who has ever lived, he’s as old school as it gets. He refuses to use the computer for scouting because software can’t tell if a player has instincts, can hit the cut-off man, or rebound from an 0-5 night at the plate. And when it comes to his job as Adams’ father? Well, he was hardly attentive during her childhood, and we eventually come to realize why. His wife died in 1989 at the young age of 39, and unfortunately he has allowed that hurt to hold him back from being the father he needed to be. There’s a moment when Clint visits his wife’s grave, and if you aren’t emotionally touched when he sings You Are my Sunshine to her then I pity your calloused soul. Adams does a great job of portraying the bitterness and resentment her character has held for so many years because of her father’s neglect, and she and Clint share a great father-daughter chemistry. This girl’s got sass, and watching her go toe-to-toe with Clint is great fun. And I have to admit – her relationship with Justin Timberlake is well done also. I’ve never cared for the ol’ chap or thought much of his acting ability, but he plays this role low key and manages to not be annoying. The innocent flirting between him and Amy works. Some of you may find the film to be overly sentimental, too by-the-numbers, and you might bark that it panders too much to its audience. So be it. I don’t really care. I said it earlier and I’ll say it again – I love Clint, and I love baseball, and Trouble with the Curve delivers just the right combination of drama and laughs to send a viewer like me home with a smile on my face and a spring in my heart. Clint Eastwood is in Space Cowboys with Tommy Lee Jones who is in Men in Black III with Josh Brolin who is in Hollow Man with Kevin Bacon. Rated PG-13 for language, sexual references, some thematic material and smoking, Trouble with the Curve has some rough language. The worst offenders are approximately 5 G-d**ns and one f-bomb. It doesn't push the PG-13 limits, but beware. This certainly isn't for children. There are too many adult themes that would fly right over their little heads. I think it could have had the chance to turn for ya… if Clint decided to go visit Meryl in Madison County!